Huge support at The 1st International Fullcontact Karate Championship! With over 500 athletes spread over 8 weight classes, one can safely say this is a giant success! Remember, this is a tournament for senior athletes, and with the high number of fighters there will be very strong champions to crown! Of course, Japan is the largest nation, but also a large number of other nations will participate. 96 fighters outside Japan, and a total of 22 nations. Through 19th and 20th of May, we will see who can manage to reach the top! 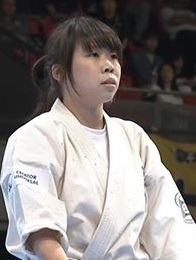 From the JFKO All Japan Open we have seen that the tournament have grown year after year. From the start we mainly saw the profiles of WKO Shinkyokushinkai, but little by little the members of JFKO in its full width became visible more and more. By the start of 2018 the JFKO had over 300 groups joined/schools in their organization. In the last JFKO tournament, The 4th All Japan Open, we witness solids categories. In total the men division had close to 300 fighters (!) with 114 fighters in the lightweight as the largest category. Counting in the women categories, brought the number of fighters close to 400 hundred. And now increasing with further 100 fighters..
Reign 4th All Japan Open JFKO champion, super heavyweight 2017. But it is`t all about the numbers of course, but in this case it gives us a picture of the direction things are moving. Looking at others that struggles to fill their tournaments, with just a handful of fighters in “World tournaments”. We think this “recipe” used by JFKO, with WKO in a important role is one of the main factors. Replacing the Shinkyokushin All Japan Open with the JFKO All japan Open, and building further from there. To sacrifice something to gain something more. The command way has been adding new tournaments, in an all ready tight schedule. 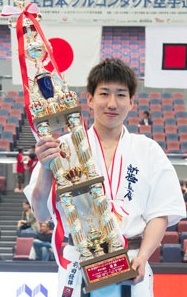 ⇒ Yuki Maeda (Shinkyokushinkai) 1st an 2nd All Japan Open Champion Middleweight. All Info: from official JFKO website visit for updates! This entry was posted in Tournaments and tagged Japan Fullcontact karate organisation JFKO, shinkyokushin by Steffen. Bookmark the permalink.